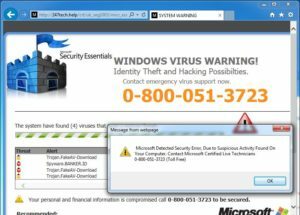 A new wave of pop up messages claiming that you have a virus and demands that you call a support line actually contains a virus that could harm your computer and even worse, lead to identity theft. Here’s what you need to know to protect yourself from scareware. Users presume that the warnings were legitimate, but later find that they are victims of scareware. Alarmingly over the last few weeks we have seen the number of reports of this scam triple, with users reporting wanting to throw the computer through the window as the scam renders the computer unresponsive with infinite popups appearing. Users presumed that the warnings were legitimate, but later find that they are victims of scareware. Malicious computer programs designed to trick a user into buying and downloading unnecessary and potentially dangerous software, such as fake antivirus protection. The claims in the alert messages are false and the page has no connection to Microsoft or any other legitimate organisation. Your computer has not been blocked and the page has not detected any virus infection or information theft. The message is designed to panic you into calling criminals masquerading as tech support workers. If you call the listed number, the criminals will try to trick you into providing your credit card details to pay for your computer to be fixed. You may also be tricked into downloading remote access software that will allow the criminals to install malware on your computer and steal your personal and financial information. If one of these scam warnings appears in your browser, do not call the listed number under any circumstances. 1: Hit “Control – Alt -Delete” on your keyboard and then click “Task Manager”. 2: Click the “Processes” tab. Highlight any processes related to your browser and hit the “End Task” button. 1: Hit “Command + Option + Esc to open the “Force Quit Applications” window. 2: Select the name of the browser you are using and hit the “Force Quit” button. It would also be wise to scan your computer for malware. In the event that you are unable to stop the popups outside these hours then unplug or hold down the power button on your pc and call us as soon as possible. If you have documents that require saving press alt and tab to change the application and save as normal first.